I'm about that wash and go life, and at this stage in the game I've pretty much perfected my wash and go. I mean dang, it only took me almost 2 years. Seriously, it took me 22 months to nail the wash and go. 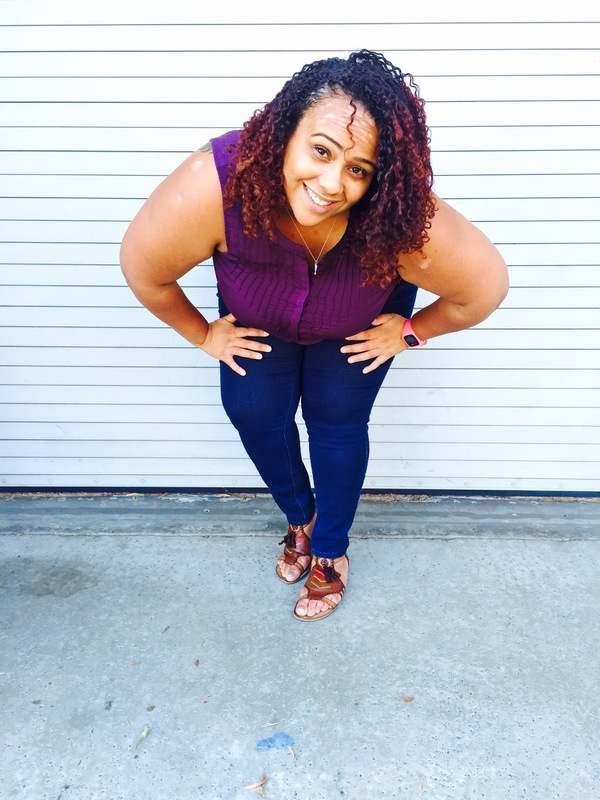 I had it pretty much down before coloring my hair, but once I took the color plunge in October 2014, I had to learn my curls all over again. Well, mama I made it! In all that time learning, I spent a lot of money, tried a lot of products, experimented with a lot of cocktails, and spent many moons in the return line at Sally's, Target, and Ulta. In my opinion, it was time and money well spent because my hair is super healthy (the healthiest it's been since being color treated), my curls are popping, and there are no "surprises" (flakes, dry hair, breakage, rough-feeling hair, white balls, etc.). Oh. and my curls look just as good, if not better, than they did on day 1. What's my secret? 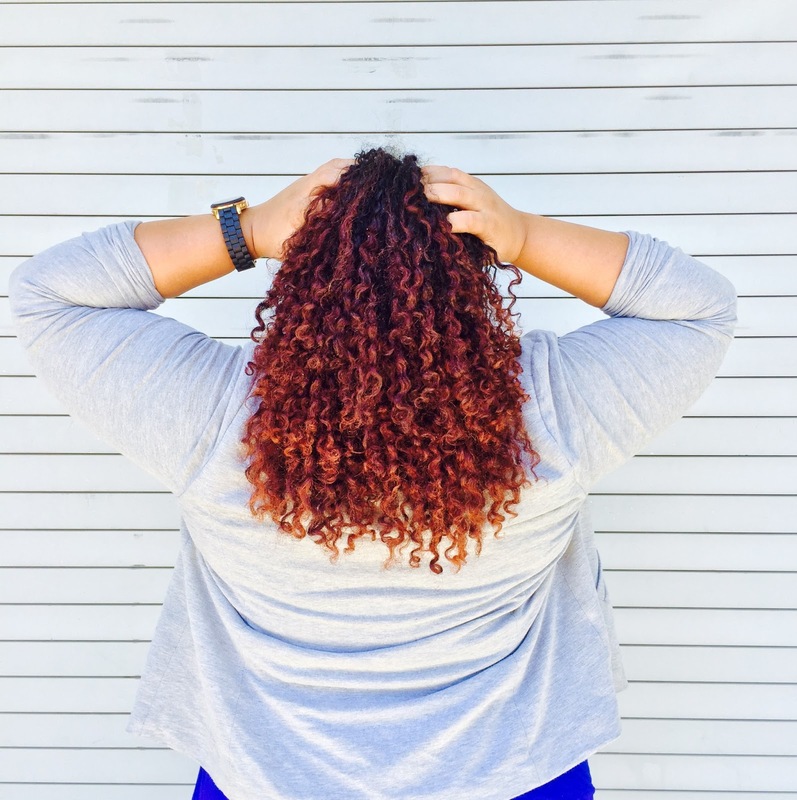 Keep reading to find out how I achieve curls like this in a few simple steps! Clean hair and a clean scalp are must-have foundations for styling. My co-wash ace in the hole, A1 since we met, hair BFF/bae is none other than Be Kekoa Be Clean Cleansing Conditioner. I'm sure y'all are tired of hearing me talk about it, but this stuff is the TRUTH. My hair and scalp are clean, free of buildup, hydrated, smooth, soft, and de-frizzed flawlessly after each use. Be Clean leaves me with the perfect canvas to begin styling. If your co-wash or cleanser leaves you with tangles, hair that feels rough, frizzy, or otherwise not its best -- you can't expect to achieve your best style results, either. This step is totally optional, especially if you don't have color treated hair. My hair always lets me know when it's time to re-up on ApHogee Keratin 2 Minute Reconstructor. My curls will look a little limp, and seem a little looser than normal. After a few treatments with the Keratin 2 Minute Reconstructor, my curls bounce back to life and have an extra spring in their step. 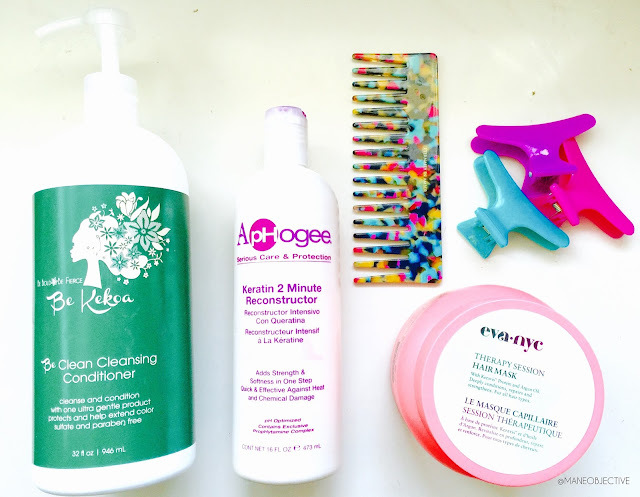 I use the ApHogee Keratin 2 Minute Reconstructor as an intermediate step between cleansing and deep conditioning. It's a 2-5 minute process, and totally foolproof. I've talked here about the benefits of deep conditioning. And while I have many favorites (hey tgin, Hydratherma Naturals, and Shea Moisture), I ride hard for Eva NYC Therapy Session Hair Mask. My hair loves it. In terms of styling, deep conditioning ensures that your hair remains healthy, hydrated, properly moisturized, de-frizzed, and elastic -- all necessary components for healthy hair and long-lasting style. 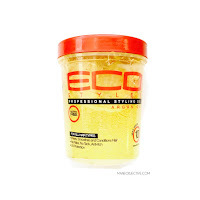 Deep conditioning helps insure that your hair's internal hydration and exterior lipid barrier remain in tact. In other words, your deep conditioner should help keep your hair from going crispy and dry. 1. 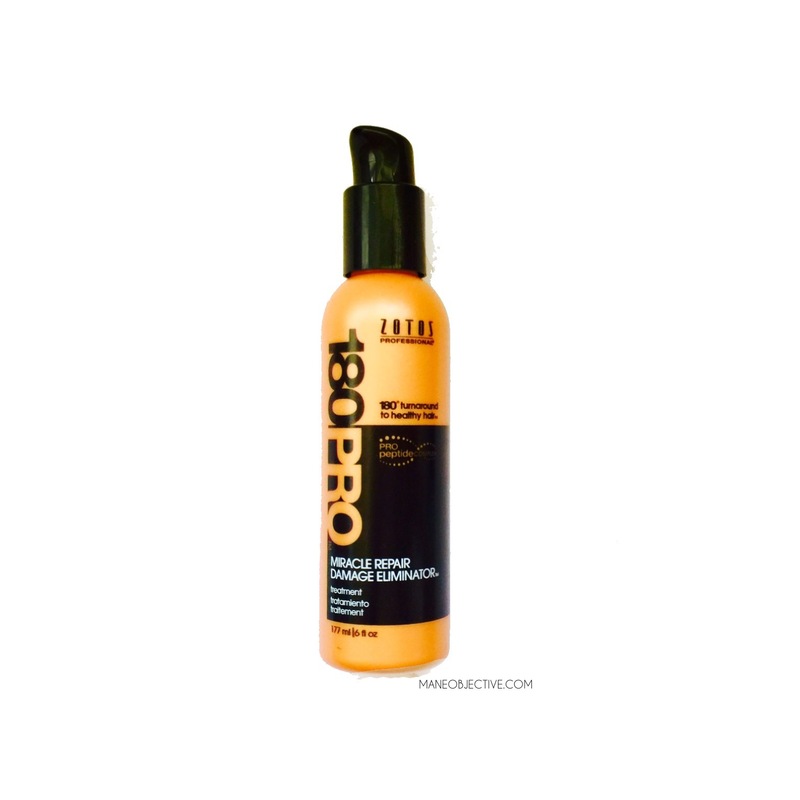 While in the shower, I apply Zotos Professional 180PRO Miracle Damage Eliminator to my hair from ends to root. It's a lightweight primer, and lives up to its name and claims. My hair is always instantly stronger, shinier, smoother, and my curls pop even more every time I use it. I notice the most visible change on the ends of my hair. Instead of hanging a little looser, my ends form actual curls when they're dry after I use Miracle Damage Eliminator. It's a super lightweight serum that doesn't dry out my hair, and more importantly, plays nicely with other products. I can't say enough good things about this stuff. I've been in love since first use (the bottle is small but lasts a long time -- a little bit goes a long way). I'm on my third full-size bottle and I don't ever want to run out! 2. After applying my Miracle Damage Eliminator, I take generous amounts of Soultanicals Mango Dip Detangling slip and rake it through my hair. This stuff is botanical magic -- seriously. Not only does it smell amazing, it's an awesome detangler, and super hydrating leave-in. After I thoroughly apply the Mango Dip Detangling Slip, I employ my little trick to get my hair super saturated while eliminating frizz. I quickly (like seriously 1 second quick) run my hair back under the shower water and squeeze the products into my hair. I don't wring out the excess. When I get to the ends of my hair, I squeeze the extra product and water back into the roots of my hair. This serves two purposes for me: one, I'm not sending precious product down the drain. Two, my roots are the most puffy, and putting extra product back on them helps keep them sleek and frizz free. 5. 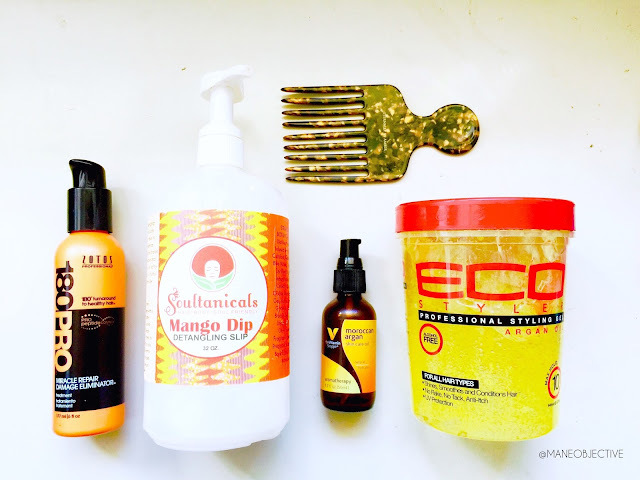 Learn the Oils/Butters Your Hair Loves, and Seal. 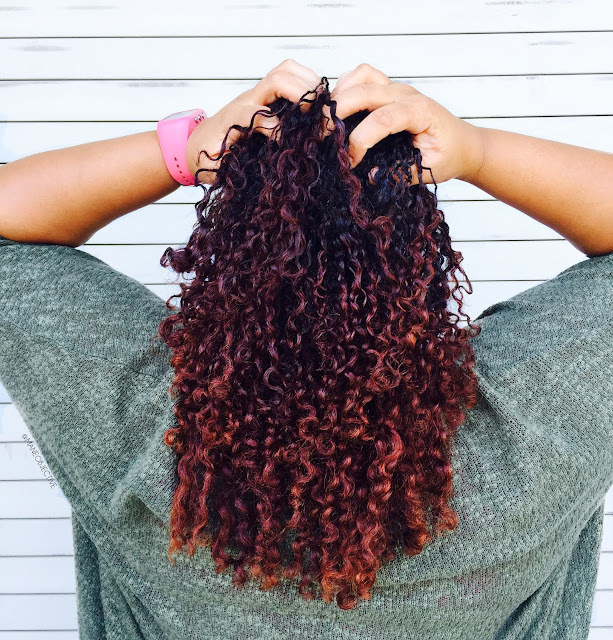 Sealing in all that yummy moisture is an integral component of a long-lasting wash and go style. 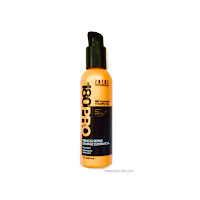 When hair is truly hydrated and moisture is locked in, style-disrupting frizz and poofiness is diminished. For this particular wash and go, I'm holding on tight to Vitamin Shoppe Argan Oil. I alternate between Argan, Coconut, and Jamaican Black Castor Oil for 99.9% of my wash and go styles. Yes, I am heavy-handed with product and the reason is twofold. One, more generous product application means a firmer gel cast and a longer lasting wash and go. Two, the weight of the gel helps my hair to dry my hair in a somewhat elongated state, minimizing how disproportionate my shrinkage looks across multiple textures. 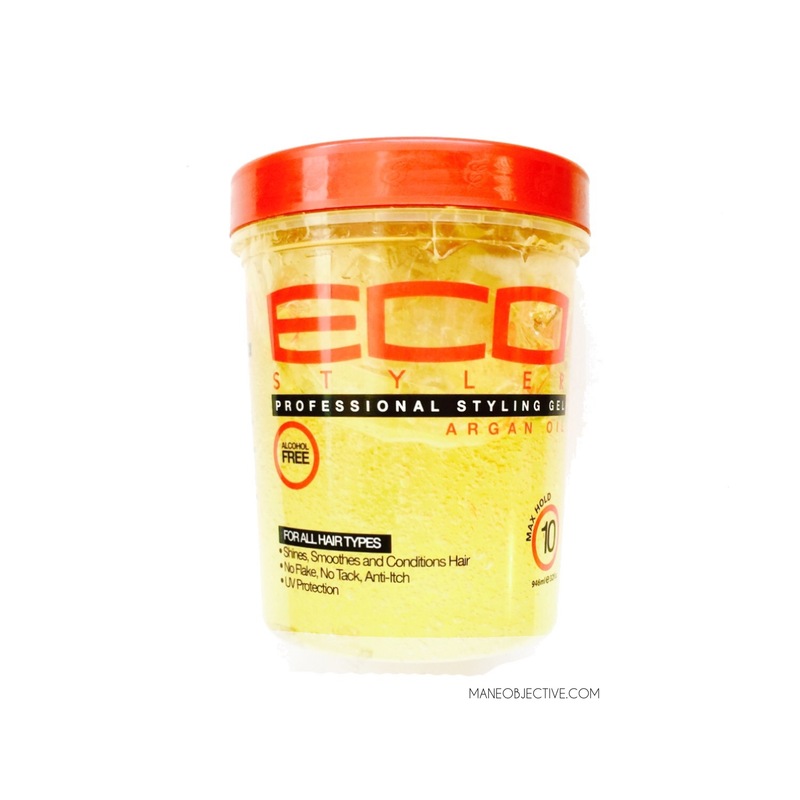 Don't love EcoStyler Gel? Here are 11 alternatives. Air drying is a pain, and depending on your density and porosity, it can be an all day process. I don't mind it though, because the alternatives are much more labor intensive and yield less favorable results. Diffusing pushes the hair upward toward the scalp and promotes shrinkage. Hooded dryers do the same, while keeping the hair flat to the head and reducing volume and bulk in the hair. I am not against shrinkage per se -- I just have multi-textured hair and each section shrinks differently. To give the appearance of more uniform curls with volume and minimal frizz, air drying is the way to go. But if you absolutely must diffuse... watch my Diffusing Hacks video here. Because I love you guys for continuing to read my blog and be patient with me, I've created a pinnable infographic that summarizes the information here. Pin it to your boards for safe keeping, and don't forget to follow me on pinterest! 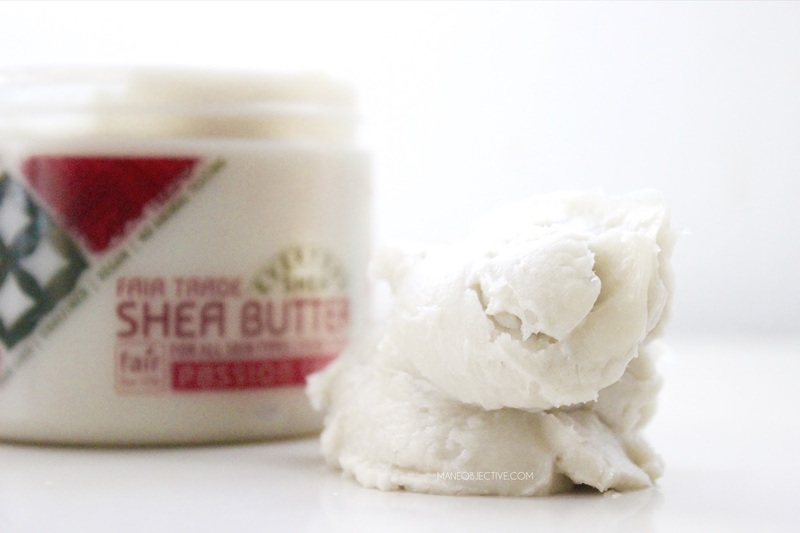 Earlier this week, news rocked the natural hair world when the internationally known household brand Shea Moisture announced a new partnership with Bain Capital. I found that I was not alone. Across social media, discussions popped up questioning the move, and emotions ran the gamut of the spectrum – from encouraging and congratulatory, to suspicious, hurt and disappointed. At first, I was upset. Then, after listening to Richielou Dennis’ Hangout, I was less disappointed. After doing some digging on Bain Capital, I got a little concerned. And that’s where I am now – accepting, but with some heavy reservations. Off the cuff, I appreciate Dennis and Shea Moisture’s transparency in the deal. Not only did they release a statement via Facebook (and they’ve been incredibly responsive in the comment section), Dennis hopped on a Google+ Hangout with Naturally Curly founder and CEO Michelle Bryer, where he tackled the tough questions and top concerns with an honesty and poise that came across as thoughtful and sincere. I detected a hint of shade toward another brand that sold out earlier in 2014 (which made me chuckle), but I appreciated Dennis’ ability to articulate the difference in how Sundial is handling the matter. Sundial has been courted by many businesses seeking to invest and/or buy them out, but they chose Bain because they are a partner with a proven record of supporting mission-driven business. Shea Moisture has not been sold or bought out. The family still owns the majority and controls executive and day-to-day operations. There will be no formula changes in products because they make their own products and control all of their own manufacturing. They are already the lowest cost manufacturer in their industry, so there is no benefit in switching manufacturers (the most common reason for formulation changes). The company understands the criticism, due to what Black consumers have experienced in the marketplace before. Bringing on an investor does not mean Sundial will be abandoning their core customers. It allows them to compete on a broader scale against other multi-national corporations who didn’t pay attention to the beauty needs of Black women until very recently. Again, they are not abandoning Black women – but they recognize that since Black women have been given the best in the industry via Sundial, women of other backgrounds are interested in that same access as well. Sundial Brands is a pioneer in the beauty industry, having brought excellence on a broad scale to the Black beauty space, out of their belief that Black Women deserve access to everything great in personal care and beauty. Bain Capital investing in Sundial will allow them as a Black, family (majority) owned business to grow, scale and provide greater and more innovative products and resources to Black women. Dennis says, “We did this for you”, driving home the idea that Sundial did not sell out, but is rather showing that there is a different way for brands to grow, scale their efforts, and remain relevant. He highlighted brands like Karl Kinai that were innovators in urban fashion, but could not retain the capital to stay at the forefront of their industry. Sundial wants to be the innovator that continues to own the space in which they created. Now that we’ve got that out of the way, let’s deal with the real-real. You guys should know by now that I like to fact-check ev-ery-thang. The first question Dennis addressed was related to Mitt Romney’s involvement in Bain, and therefore Sundial. Dennis explained that Romney is not at Bain Capital in any active fashion, and has not been in 16 plus years. My immediate thought was, Richielou, would you found Sundial, stay 15 years to run it, and then leave empty-handed when all is said and done? Absolutely not, right? Why would you or anyone else expect Romney to do so? In fact, according to this article from Forbes, Romney left Bain with a retirement package that gave him a share of profits from all Bain funds through 2009, and the right to invest Bain funds. Currently, he holds stakes in dozens of Bain funds worth over $52 million. Concerning, but not overwhelmingly so. As much as I would love to avoid purchasing or supporting anything tied to companies or individuals I ethically oppose, it’s virtually impossible to do so due to fragmentation in manufacturing. I’m sure there are at least a dozen problems with the keyboard I’m using to type this article. The real issue for me is the ethics of Bain Capital, and what happens to companies after they’ve invested. The water gets a little murky. From my limited (very limited to be honest, because I’m neither an economist, financial analyst, or even remotely considering an MBA) understanding, Bain Capital is a private equity firm that seeks to maximize profits in new, developing and struggling companies. Private equity firms typically target slow-growth market leaders and focus aggressively on leveraged buyouts that result in extreme cost-cutting measures for the business to be able to repay the debt laid on it by the firm. The end result is that the companies find it difficult to remain competitive, because the capital that would have gone toward innovation, development, and expansion is used to pay off the company’s debt. To put a lid on that brief lesson, let’s consider this: from 1988 to 1997, Bain Capital invested millions in Sage Stores, American Pad & Paper, GS Industries, Dade Behring, and Details. All of them filed for bankruptcy by 2003. This information may seem a bit dated, but it is telling. Sundial has made it clear that they have not been bought out by Bain, but rather that Bain has invested in them at an undisclosed, non-controlling minority percentage. Perhaps that will be the difference, and perhaps Sundial will truly show us a new way for Black business to grow and expand without selling out and selling themselves short. I hope to be able to take Richielou Dennis and Sundial at their word and see the brand blossom in the years to come. I just wish it could have been accomplished with Black dollars. What are your thoughts on the Sundial and Bain Capital partnership? Sounds off in the comments below the "You Might Also Like" section. What Does the New Shea Moisture // Bain Capital Partnership Mean for the Natural Hair Community? I did something physical every single darn day of August. Even if y'all don't clap it up for me, I'm gonna clap it up for myself. That's a tremendous accomplishment for someone who pretty much didn't used to believe in physical activity of any sort. I also did a bit better in the eating department. Now, I've had my fair share of flubs in August, but all things considered I think I gave it a B-/C+ effort in the eating better department. 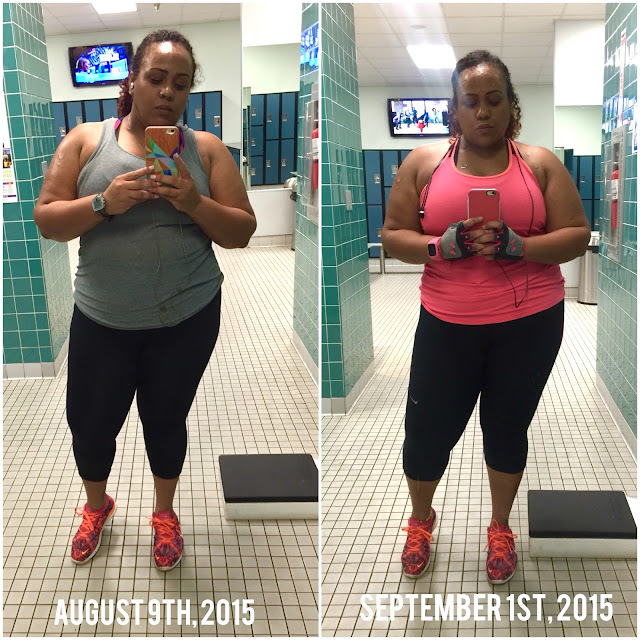 As a result of my commitment, I dropped 4 pounds by the end of August. Not a tremendous amount, but definitely enough to keep me going. Don't take this to mean that I was extraordinarily motivated to work out, either. There were days that Samuel practically had to drag me, and downright force me to do a workout of some sort. His line? "You said you were gonna do it, so do it." Welp, you can't argue with that logic. Every day wasn't a full on, hard in the paint gym day. There were some days where 30 minutes on the elliptical was all I could manage, or brisk walking while running errands (yes, I looked awkward doing it) had to suffice. The goal isn't to work myself out to exhaustion, it's about finding some way to move my behind every day, and fight being sedentary while managing a busy schedule. For September, you can definitely expect me to kick it up a notch! As an aside, I've discovered that Sunday is my favorite workout day. The gym is virtually empty, and I get to spend lots of time doing pretty much everything I want to do as far as workouts go. I also love the fact that in one day, I'm combining elements of spiritual and physical wellness. It ain't much to show, but here's a tiny bit of maybe progress that I'm documenting as I go. 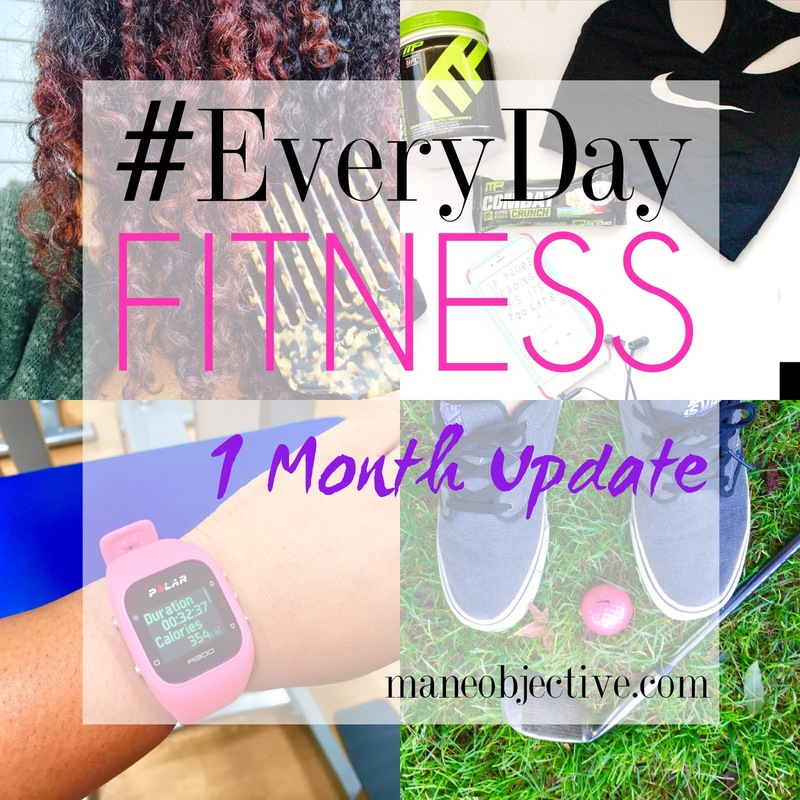 This is about 3 weeks work of #EveryDayFitness. I'm hoping that small changes really do start adding up! On a related note, my psoriasis (especially on my face) is looking clearer as the weeks go by which is a blessing. Some of you guys may think that those lighter patches on my forehead look weird, but I'm proud of them. Those smooth-esque, light patches used to be raised, inflamed dark patches. All progress is good progress. I'll be sharing some of my skincare fresh finds and HGs a little bit later. I also need to do better with drinking ACV nightly and taking my vitamins daily. I did it when I remembered, which means skipping like 3 days a week on both. Not good! I definitely need to get back on my game. How do you remember your daily vitamins? I keep mine in a 7 day pill thingie, but forget to pull it out and actually take them. Reduce the "minimum activity goal" days to 2 for the entire month. August held 3 or 4, I believe. Follow the 80/20 rule daily when it comes to eating. 80% on point, 20% aiight. Cook more -- start getting into meal prepping for the week. 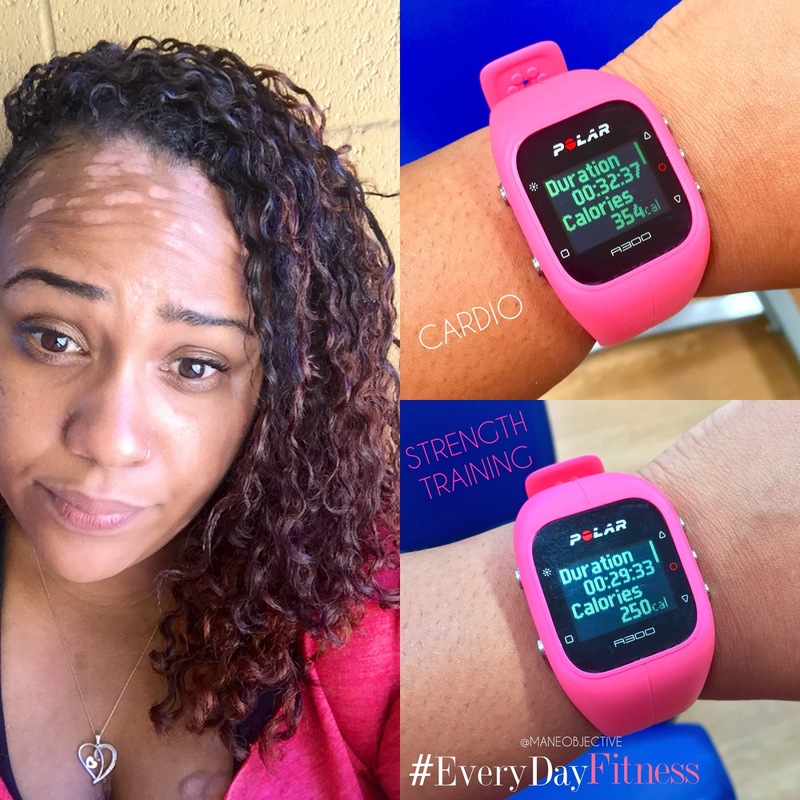 This watch has seriously been workout BAE! I use it daily without fail. I'll do a full comparison and breakdown soon, but to catch more of the features, read my article about 5 reasons to wear a fitness tracker here. 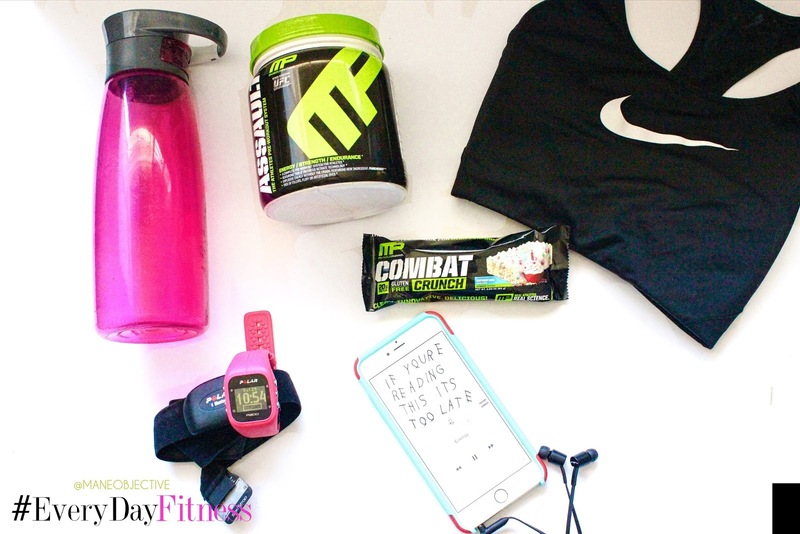 It's a good motivator, workout tracker, and must-have fitness tool in my opinion. OMG...can I just tell you how much of a blessing this stuff has been?! The shampoo doubles as my face wash, and has been instrumental in helping to calm my psoriasis. 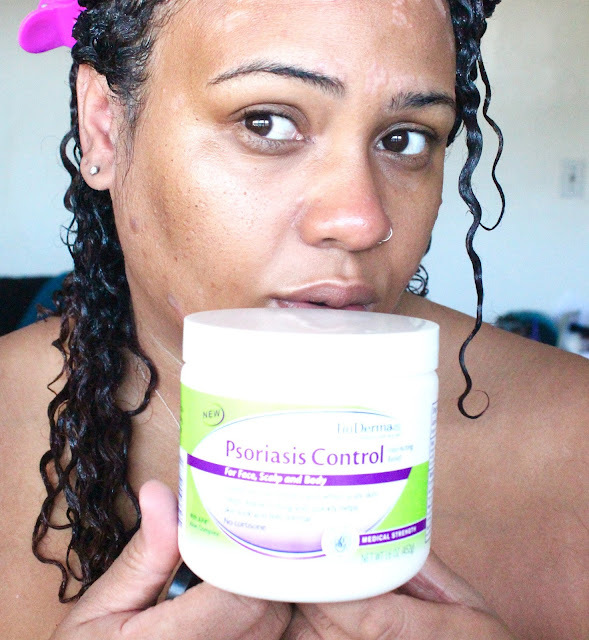 I use the Psoriasis Control Lotion daily on my skin and face. Talk about a blessing in a bottle. Read more about psoriasis relief with TriDerma here. 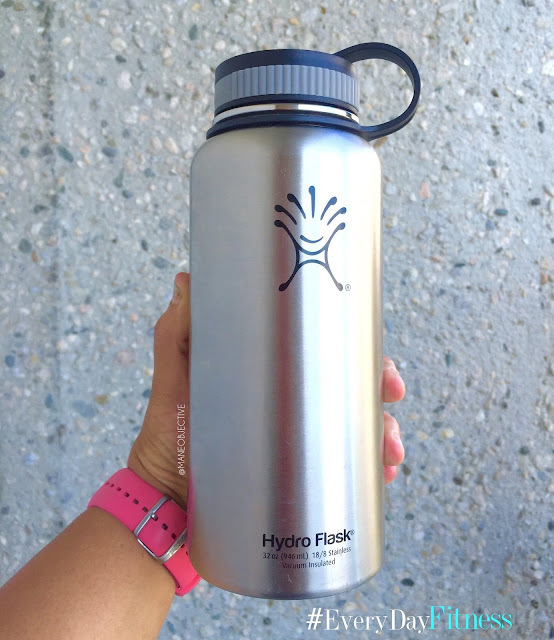 Speaking of bottles that are indeed blessings, let me introduce y'all to HydroFlask. For the longest time, Samuel's mom has been raving about these bottles and I'm just like yeah, yeah, yeah... not really paying it any mind. It wasn't until Samuel and I were going golfing that she recommended I try one out. She gave me a second one she had stashed away, and I've been hugging that bottle ever since. If you're someone like me who does not like room temperature water, THIS IS FOR YOU. If you love ice cold water while working out, THIS IS FOR YOU. If you drink water throughout the day and you like it cold allllll day long, THIS IS FOR YOU. I took my HydroFlask on the golf course in 90+ degree weather, sweated like crazy, and all the ice was still in my bottle 2 hours later! I fill my bottle with ice water for work at 7am, and at 7am the next day I still have ice. Believe me when I say this thing WORKS! No more lukewarm water for me ever again! And because I like cold water, I find myself drinking it more which is perfect for #EveryDayFitness! Since August found me being more active than I've been like, ever, I had to kick my cleansing efforts up a notch. Be Kekoa Be Clean (Bae Clean) has been my A1 since day 1, and has not failed me yet. It's the perfect gentle, yet effective cleansing conditioner that actually cleans your hair. Because I have to wash my hair twice (and sometimes 3 times) a week, I need a product that saves me time on wash day. With Be Clean, all of my hair is cleansed and detangled in 15 minutes or less. No lie. Keep a staple in the stable, ladies! I spent the month of August trying to wean myself off of the delicious albeit nutritionally terrible snacks at work. Thanks to BuffBake, I've been fairly successful. Judge me if you must, but every day I take my package of rice cakes and jar of BuffBake to work. When I'm hungry for a mid-morning or afternoon snack, and trying to resist cookies, cakes, and muffins, I pull out a brown rice cake, and get a spoon of BuffBake. 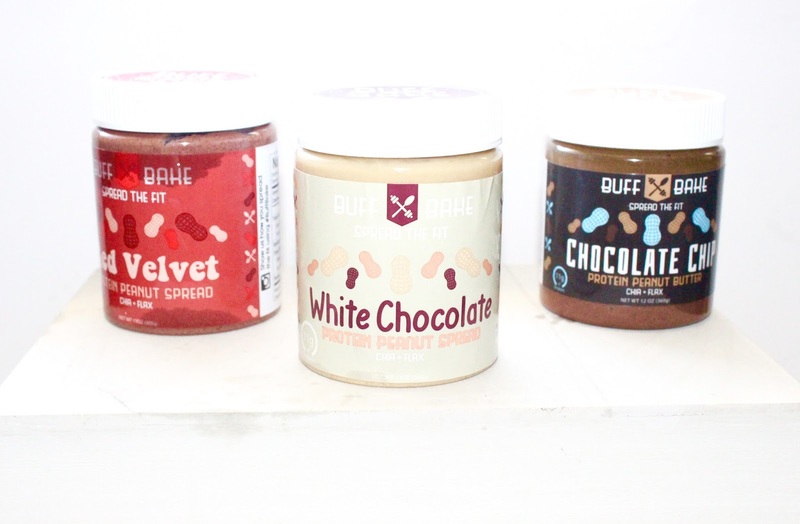 Buff Bake is a better for you nut butter enhanced with extra protein, chia, and flax seeds. It contains 11g of protein and only 3g of sugar per 2 tbsp serving! Each serving is 200 calories, but remember nuts in general are verrrrrrry dense nutritionally. I started with Red Velvet Peanut Butter and when that's done, I'm moving on to Chocolate Chip. BuffBake is super delicious, and puts a healthy spin on peanut butter while allowing me to indulge a little and not feel guilty. I'm a forever fan! I raved, and raved, and raved about Combat Crunch bars here. My rave continues. I need to get my hands on the Cookies & Cream bar, because apparently that's what's hot in the streets. I did order the Birthday Cake flavor, and while it is good, I'm all about the chocolate covered bars. I shared the joys of Combat Crunch with both my mom and Samuel's mom, and both of them are in love with them! They said the same thing -- it keeps them from wanting to eat candy. Yassss to Combat Crunch! My ride or die daily mask. It's a part of my daily facial care routine. It brightens, tones, eases inflammation, smooths, and just blesses my face. Read more about how I use it daily in my facial care regimen for psoriasis and troubled skin. 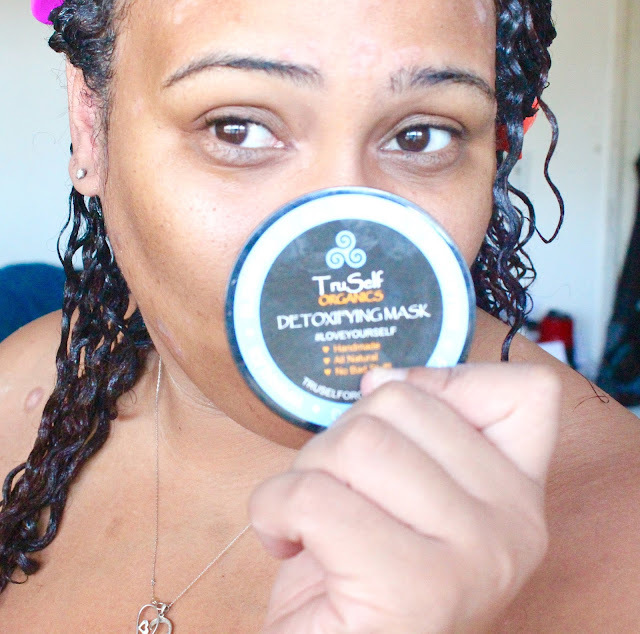 TruSelf Organics Detoxifying Mask is a newbie to the rotation, that I've begun incorporating as a part of my weekend facial care routine. Packed with bentonite, rhassoul, kaolin, Moroccan, and other clays plus pure collagen, it revitalizes, detoxifies, and lifts impurities from the skin. I blend about half a tablespoon of mask, and mix in about half a teaspoon of aloe vera juice, and half a teaspoon of apple cider vinegar. The result is a finely mixed, easily spreadable mask that I leave on for about 20 minutes. The end result is smooth skin that feels tightened, toned, and revitalized. Have you heard of by made beautiful? I hadn't either, until I strolled into my local Sally's about a week and a half ago. I made it a point to peruse the natural hair section (which is ever growing), to see if there was anything new. Then it caught my eye: a clean blue label, and rich yellow product. I sized up the ingredients, took a whiff, checked the price point, and instantly decided I was in. by made beautiful's true collection is available at select Sally Beauty locations, and at bymadebeautiful.com very soon. You can also click here to see where by made beautiful is available near you. Cetyl Alcohol: Considered "fatty alcohol" -- NOT to be confused with drying alcohols such as ethyl. Acts as a lubricant, thickener, and emollient. Also give conditioner its velvety feel without making hair greasy. Is additionally used to keep product ingredients from separating. Emulsifying Wax: A vegetable based emulsifying wax from naturally occurring fats and esters used to create a bond between water and oil for products which require their binding together. 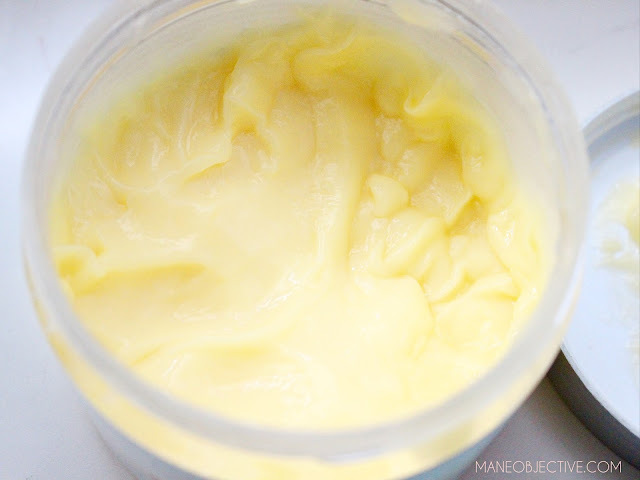 Makes a fluid cream, and lotion without the separation, and complements the finished products end texture. 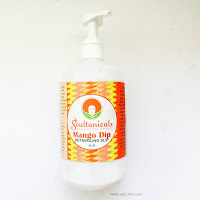 Mango Seed Oil: Rich in beta carotene, essential fatty acids and vitamins A and E. This ingredient also helps to treat dry skin and protect against future dryness. Virtually everything about the true by made beautiful Intense Treatment Masque is on point. 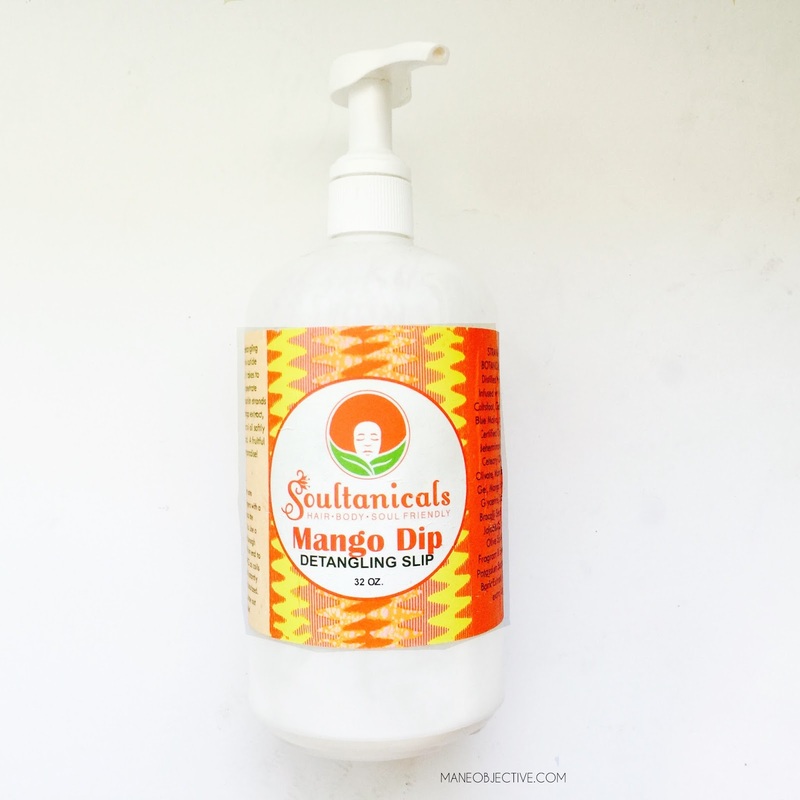 I love the fragrance (the vibrant mango fragrance of the entire line gives me life), and the price point is incredibly fair for a 12oz jar of deep conditioner. You know that meme about girls with natural hair smelling like tropical paradise? That's pretty much what happens when you use the true by made beautiful products #nolie. The ingredients are pretty impressive, and I love that the Intense Treatment Masque is rich in oils like mango seed, coconut, and olive. The performance of this product is amazing, and I wish I had more pictures to share (sometimes, I just can't be bothered with cameras on wash day). The Intense Treatment Masque is thick but not stiff, and super rich without being oily or too heavy. It glides on the hair easily with remarkable slip (considering that it is silicone-free), and soaks right into the hair. 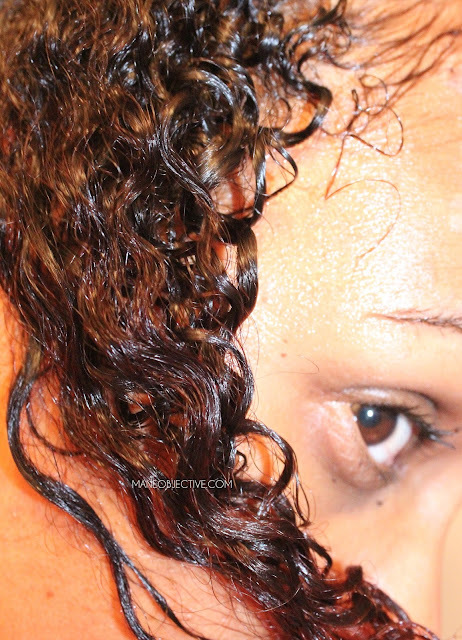 I love when I can see my deep conditioner penetrate the strands and not just sit on top. I love that it works quickly (5 - 10 minutes while I'm showering), and feels absolutely magical when I rinse it out. 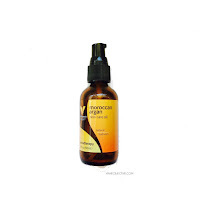 It leaves my hair super shiny, hydrated, soft, and buttery smooth. 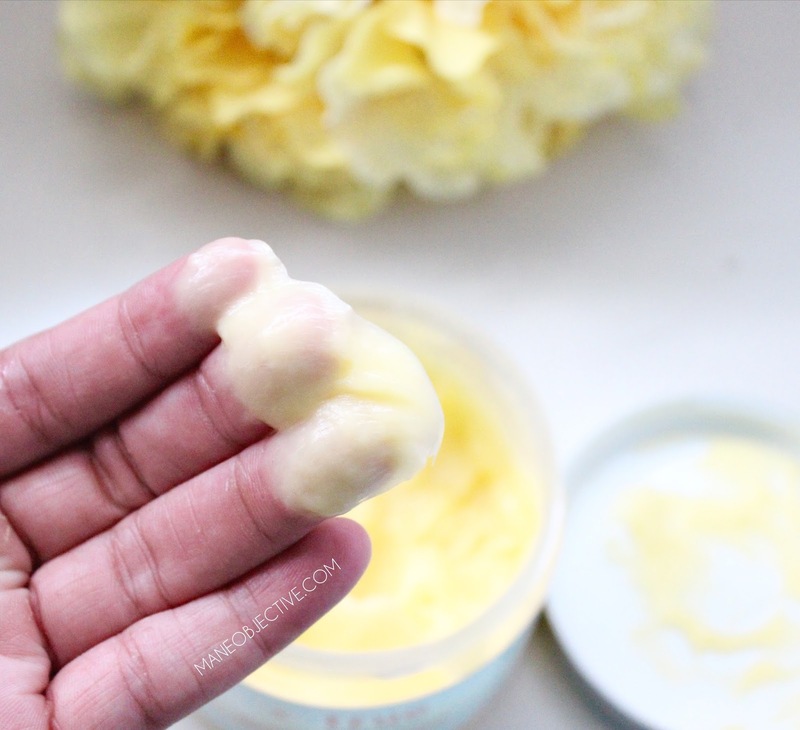 You know that buttery smooooveness that makes you stroke your strands and say, "YASSSSSS!" You see that shine though? Yassssssss! 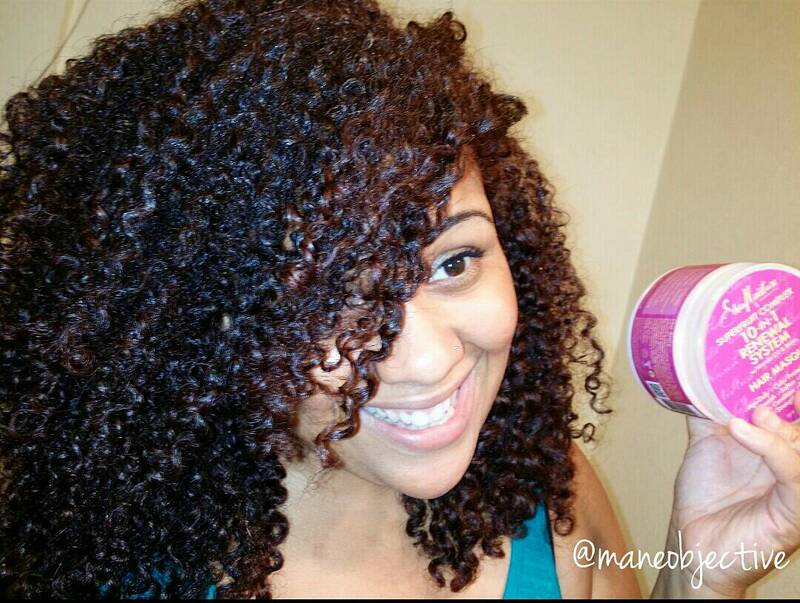 The Intense Treatment Masque pretty much hits ALL my markers for a great deep conditioner. I go back and forth with myself on this one -- the issue of fragrance. I'm never really a fan of fragrance being so high up on the ingredient list, but I'm generally okay so long as it doesn't trigger my allergies or irritate my scalp psoriasis. Thankfully, neither has happened with the Intense Treatment Masque -- but I will caution those of you with sensitive sniffers to use at your own discretion. 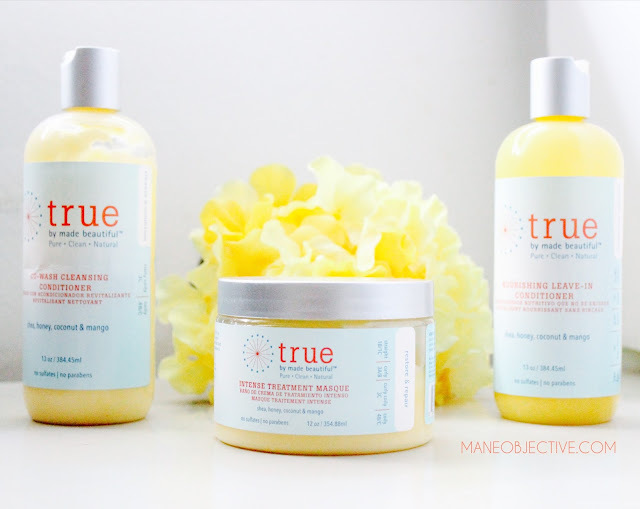 I'm falling in love with true by made beautiful Intense Treatment Masque. It has all the makings of a staple DC for me. 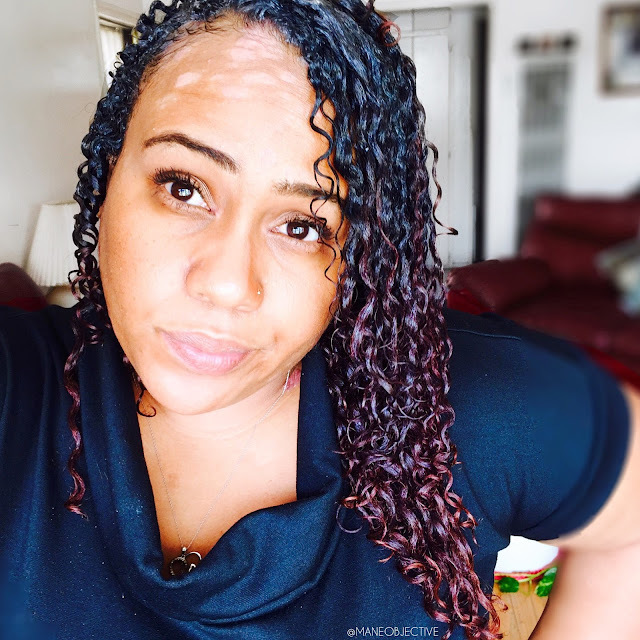 It's perfect for ladies following the CG Method who want to try something new, and great for hydrating and nourishing dry, damaged, and chemically treated hair. Because of the way it coats the hair, you can easily get several uses out of one jar, making it a great value. Without a doubt, yes. Let me text that Sally's number and get this coupon first.